Product Image May Not Reflect Square Drive of This Model. Cleco Pneumatic Stall 19 Series Reversible Angle Nutrunners are designed for soft-draw applications. Cleco Pneumatic Stall 19 Series Reversible Angle Nutrunners feature a compact angle head that provides superb access, a lever start, and sliding knob reverse. Cleco Pneumatic Stall 19 Series Reversible Angle Nutrunners are lightweight, ergonomic, and easy to service. 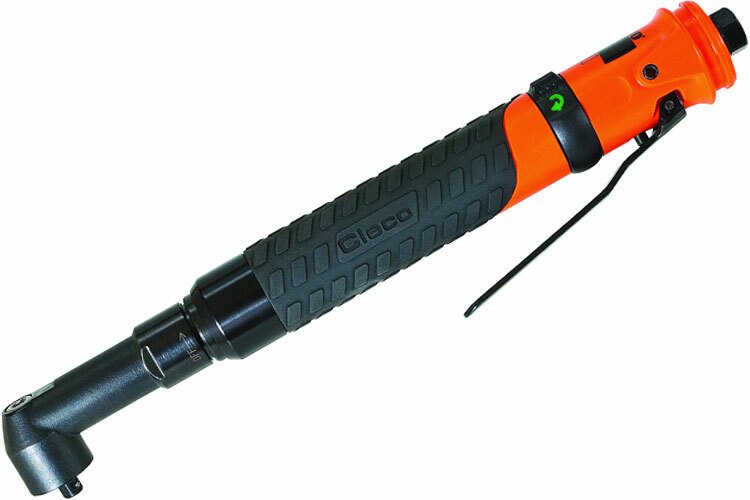 The grip material on the Cleco Pneumatic Stall 19 Series Reversible Angle Nutrunners is tested to withstand a range of industrial chemicals. Each Cleco Pneumatic Stall 19 Series Reversible Angle Nutrunner is tested and certified by a technician prior to shipment. Cleco nutrunners are available with stall-type torque control, giving operators more control over power output and speed. In this configuration, the nutrunner runs until resistance in the fastener causes it to stall. Then, the operator can release the throttle and remove the tool. This can be especially useful for applications with varying torque rates. The 19RAS04AH2 Cleco Pneumatic Stall 19 Series Reversible Angle Nutrunner, 1/4'' Square Drive is one of thousands of quality tooling products available from MRO Tools. Please browse Cleco Pneumatic Stall 19 Series Reversible Angle Nutrunners for tools similar to the 19RAS04AH2 Cleco Pneumatic Stall 19 Series Reversible Angle Nutrunner, 1/4'' Square Drive. 19RAS04AH2 Cleco Pneumatic Stall 19 Series Reversible Angle Nutrunner, 1/4'' Square Drive description summary: Cleco Pneumatic Stall 19 Series Reversible Angle Nutrunner Square Drive: 1/4'' Max Torque: 2.6ft-lbs. / 3.6Nm Free Speed (rpm): 1,500 Overall Length: 11.2'' / 284mm Weight: 1.4lbs / 0.6kg Head Height: 1.19'' / 30mm Side to Center: 0.5'' / 13mm Quantity discounts may be available for the 19RAS04AH2 Cleco Pneumatic Stall 19 Series Reversible Angle Nutrunner, 1/4'' Square Drive. Please contact MRO Tools for details.